It turns out that your parents were right all along, and that you should have been a doctor rather than a meme artist/ex-Vine star/dog hairdresser. These maps, created by Zippia, show that America definitely isn’t a place of equality. They show the highest and lowest jobs in all 50 American states, using stats from 2015 from the Bureau of Labor Statistics’ website. 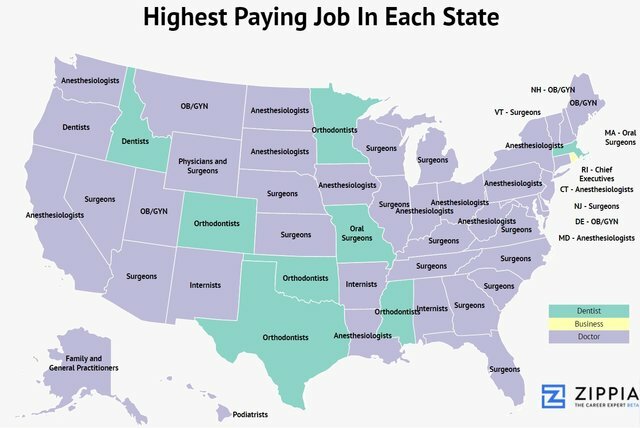 Medical professionals ranging from surgeons, dentists, anaesthesiologists and gynaecologists make the most money, with the highest earners of all being anaesthesiologists in North Dakota who earn a cool $283,200 a year. In terms of low paying jobs, the food and restaurant industry dominate. Line-cooking, gaming dealers, ushers and shampooers also show up frequently. 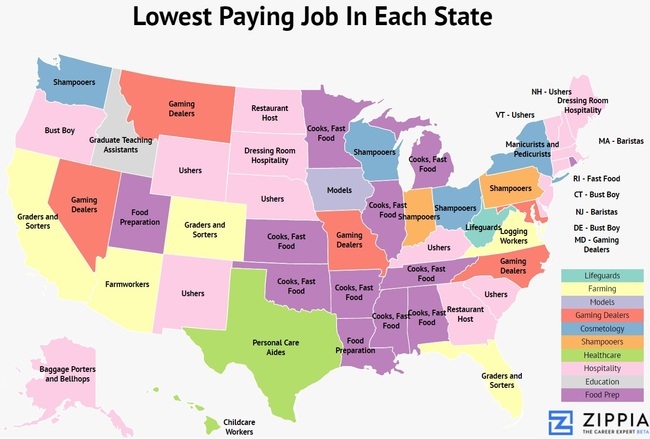 The lowest paying job shown is a Wisconsin shampooer, with a salary of $16,960. Love maps? Check out our map of road trips across America, a map of the world’s most popular attractions in every country and just for fun, some maps that only Americans will find funny.